Sorry about the all-caps in the title there, folks. I can’t bold or italicize in the entry title. I have what scientists call a “fairly keen sense of smell.” I wonder if people who get migraines have heightened senses, because when I used to get migraines, the slightest foul odor from 50+ feet away would make my stomach churn. Not only do I have a keen sense of smell, but I like to smell things. Prepare yourself for the weirdness of the Smelling Circle if you don’t already know about it. Add those two things together, and you have a guy who thinks he can smell odorless gases. I think the most commonly known odorless gas is radon, so that’s the one I think of the most. I’ll be sitting at work, minding my own business, when I smell something a little…off. I sniff again. It’s definitely not normal, but I can’t put my finger on it. Wait, I think. What if it’s radon? …what if I can smell odorless gases? What if I’m smelling an odorless gas right now?!? 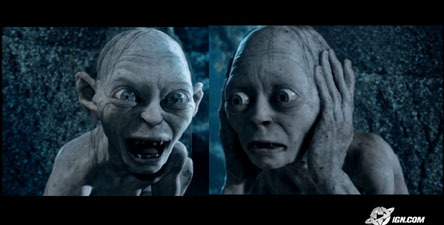 By this point I’m perched on my desk in a low crouch, debating with myself just as Gollum debates with Smeagol. With the exact same amount of loincloth. Of course, even if I could smell odorless gases, this is pretty much the most useless special ability in the world, of course, because if you smell radon, you’re probably dying of radon poisoning. And I also can’t prove that it’s radon, so I usually just go back to work. Have you ever shared that sensation? That you can smell odorless gases, or perhaps hear those wavelengths that only dogs can hear, or see gamma rays? This entry was posted on Wednesday, August 29th, 2012 at 12:34 am	and is filed under My Greatest Fear, superlatives and tagged with superlatives. You can follow any responses to this entry through the RSS 2.0 feed. The Bionic Woman specifically targets bloggers? I use my heightened sense of smell a lot at work (this is probably pretty strange), because sometimes I’ll notice that something just doesn’t quite smell right, and most of the time it turns out to be the scent of whatever the person spilled on the phone. So far I’ve been lucky with this and the worst smells I’ve uncovered were nothing more than coffee, potato salad, and tanning lotion– strange things to be certain, but I don’t ask questions about how those things end up there. Saurkraut is man’s worst enemy. It is pungent. I’m glad that you put your sense of smell to work! You’re the human equivalent of a hound dog. I don’t really have anything to contribute other than to say that I do not have super powers of smell, hearing or sight but I found this post hilarious. I can’t stop laughing at the Gollum picture and thinking of you sitting at your desk freaking out about Radon. Thank you for the morning giggles!